I've been putting myself under the gun recently, and so I have to take stock of what I want to do in light of how much time I have. Work puts a damper on how much time you can spend knitting (for some odd reason, they don’t approve of knitting at your desk). So while I was going to do a Summer Sweater Knit-a-long, I think I’m going to have to re-think that. So, I’m having a mid-year adjustment. I have lots of socks lined up, and if I can knit one pair every two weeks, I should be fine for Christmas. Now, that being said, there are 10 pairs left to knit, if I don’t include the extras for those who may drop in, and we have 27 weeks until Christmas. Yes, I did just count that out on a calendar. That gives me a little bit of free time, in theory. Those 10 pairs also include 2 pairs for my children, and those usually take less time (and yarn). I recently left my current sock at my in-laws. This was mildly frustrating because I really didn't want to work on anything else. It was a nice escape. It is also MY sock. 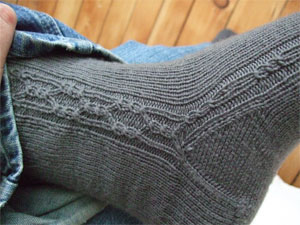 It was toe-up, and a skein that I received from a swap. It called to me, and it wanted to be a lovely pair of socks, for me. It’s completely selfish, but I think every now and again, we need to do a bit for us. I will probably be knitting mostly socks for the rest of the year, but trying to toss in a few other projects as well. I do want to get Princess a birthday sweater done (hers is in September, and I already have the yarn). I’d like to get both children a sweater made for Christmas, but I don’t think that will happen this year. I think instead, I’m going to sew for them for Christmas. I have a couple of quilt tops to be made; if I can set aside the time and space to cut them out and sew them up. I have two that need the sashing between the blocks and then just to put them together. I have two more waiting to be cut, but one needs a pattern decision. The more I get into sewing, the more I want to explore. I have plans for a skirt for myself, two purses, and at least one more skirt. I still have plans for sweaters. I think I’m going to take a cue from Truly Myrtle, and next year, work on outfits for me. I think this may be the last year I decide to make a bunch of gifts for Christmas, with the exception of my children. I love making them things, and since they are small, any clothing goes quickly. The next major project that I’m tackling: the house. We have a lot of small projects to do around the house and it’s mostly a matter of time. Some of it is money, but if we use what we have and carefully plan, we will be able to afford what we need when we need it. Right now, it’s about cleaning and getting rid of stuff we don’t use or want (read: junk) and also painting. We have paint for 3 rooms, and we haven’t even started yet! It’s time. We've been here for six years, and it’s still not us. The time has come. The time is now. I know this will cut into my knitting time, but that’s okay. Remember the extra time I had built in? It’s a matter of wisely using it. I can paint when my kids go down, or on the weekends, and if I take the time to spread out the prep work, the actual painting won’t take long. Each project has several steps, and even if those steps get spread out over several days, there are no decorating police (at least I hope not – if so, we’re in deep trouble). I also think if you take your time about it, you can really make it look good. I have found if you slow down, you make fewer mistakes usually. Not everything is a race, and sometimes taking your time is helpful. You catch things you might otherwise miss.